This system is designed to be a supplementary park aid. It may not work in all conditions and is not intended to replace the driver’s attention and judgment. The driver is responsible for avoiding hazards and maintaining a safe distance and speed, even when the system is in use. Note: The driver is always responsible for controlling the vehicle, supervising the system and intervening if required. The system detects an available parallel parking space and automatically steers the vehicle into the space (hands-free) while you control the accelerator, gearshift and brakes. The system visually and/or audibly instructs the driver to park the vehicle. The system may not function correctly if something passes between the front bumper and the parking space (i.e. a pedestrian or cyclist) or if the edge of the neighboring parked vehicle is high from the ground (i.e. a bus, tow truck or flatbed truck). Note: The sensors may not detect objects in heavy rain or other conditions that cause disruptive reflections. Note: The sensors may not detect objects with surfaces that absorb ultrasonic waves. Note: After a tire change the system will go through a relearning procedure. During this time the system performance may deteriorate. The system should not be used if: • a foreign object (i.e. bike rack or trailer) is attached to the front or rear of the vehicle or at another location close to the sensors. • an overhanging object (i.e. surfboard) is attached to the roof. • the front bumper or side sensors are damaged (i.e. in a collision) or obstructed by a foreign object (i.e. front bumper cover). • a mini-spare tire is in use. Press the button; the touch screen displays a message and a corresponding graphic to indicate it’s searching for a parking space. Use the turn signal to indicate which side of the vehicle you want the system to search on. Note: If the turn signal is not on, the system automatically searches on the vehicle’s passenger side. When a suitable space is found, the touch screen displays a message and a chime sounds. Slow down and stop at approximately position (A), then follow the instructions on the touch screen. Note: You must observe that the selected space remains clear of obstructions at all times in the maneuver. Note: Vehicles with overhanging loads (e.g. a bus or a truck), street furniture and other items may not be detected by active park assist. You must ensure the selected space is suitable for parking. Note: The vehicle should be driven as parallel to other vehicles as possible while passing a parking space. 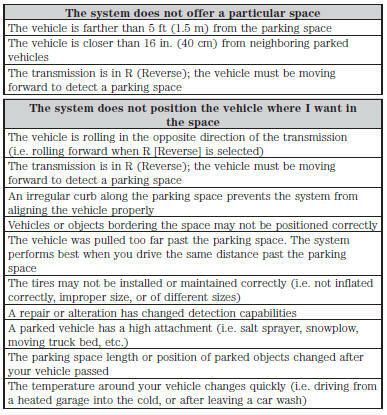 Note: The system always offers the last detected parking space (i.e. if the vehicle detects multiple spaces while you are driving, it offers the last one). Note: If driven above approximately 20 mph (35 km/h), the touch screen shows a message to alert the driver to reduce vehicle speed. Note: If vehicle speed exceeds 6 mph (10 km/h), the system turns off and you need to take full control of the vehicle. Note: If a maneuver is interrupted before completion, the system turns off and you need to full take control of the vehicle. In some instances after an interruption a message may appear that would allow you to resume the maneuver. With hands off the wheel (and nothing obstructing its movement) and the transmission in R (Reverse), the vehicle steers itself as instructions to safely move the vehicle back and forward in the space are displayed in the touch screen. While reversing, the touch screen displays a message instructing the driver to check their surroundings (for safety reasons) and to back-up slowly, accompanied by a corresponding graphic. When you think the vehicle has enough space in front and behind it, or you hear a solid tone from the parking aid, bring the vehicle to a complete stop. When automatic steering is finished, the touch screen displays a message indicating that the active park assist process is done. The driver is responsible for checking the parking job and making any necessary corrections before putting the transmission in P (Park). • turning off the traction control system. Certain vehicle conditions can also deactivate the system: • Traction control has activated on a slippery or loose surface. • Anti-lock brake system activation or failure. • Any door (except the driver’s) opens. • Something touches the steering wheel. If a problem occurs with the system, a warning message is displayed, followed by a chime. Occasional active park assist messages may occur in normal operation. For recurring or frequent active park assist faults, contact an authorized dealer to have your vehicle serviced.